Graft-versus-host disease (GvHD) is the major immunological, mainly donor T-cell-derived, complication after allogeneic hematopoietic stem cell transplantation. GvHD occurs in about 50 % of patients and is directly related to the degree of mismatch between HLA proteins of host and donor. Fast-proliferating organs such as skin, liver, and gastrointestinal tract are predominantly involved. 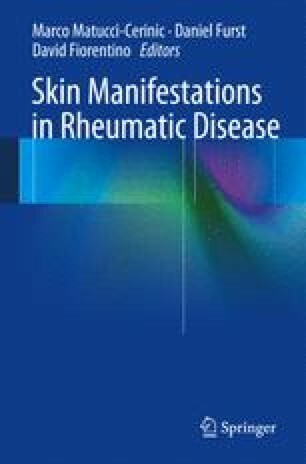 Cutaneous manifestations are broad and mucous membranes and adnexal structures can be affected as well. Today, acute GvHD is divided into classic, persistent, recurrent, or late-onset disease, and chronic GvHD is categorized as classical or overlap syndrome.